A funeral service will be held on Saturday, April 6, 2019 at 1:00 PM at the Taylor Funeral Home with Dale Ragan and Stefan Gerville-Réache speaking and Chip Haslam leading congregational singing. Place of rest will be in the Harpeth Hills Memory Gardens. Visitation will be held on Friday, April 5, 2019 from 4:00 PM until 8:00 PM and on Saturday from 12:00 Noon until the time of service. Sergeant Major John Wayne Oliphant, Sr., ARNG, Retired, of Burns, TN died on March 25, 2019 at the Horizon Medical Center. In lieu of flowers, memorials may be made to the American Cancer Society/ Relay For Life. John was born December 8, 1942 in Dickson County, TN, a son of the late Ernest Eugene Oliphant, Jr. and Elizabeth Jo Work Oliphant. He served his Country for 37 years with the United States Army and National Guard. 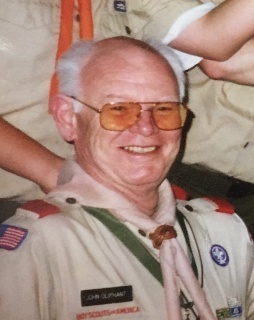 For 32 years, John was a Scoutmaster for Boy Scout Troop 96, Burns, TN. Under his tenure as Scoutmaster, 41 scouts reached the highest rank of Eagle. He was a loving husband, father and grandfather. Mr. Oliphant is survived by his wife of 55 years, Robbie Dickerson Oliphant of Burns, TN; his 2 sons, John Oliphant, Jr. of Nashville, TN, and Dr. Jason Oliphant (Jamie), serving in North Africa; his 4 grandchildren, Charlie, Nathan, Caitlin, and Mariam; his 3 siblings, Linda Williams (Neal) of Burns, TN, Judy Wall of Cumberland Furnace, TN, and Robert Oliphant of Dickson, TN. Also surviving are several nieces and nephews.